Yesterday, the high temperature here in Central Texas was a toasty 78 degrees. Sometime during the night, a front moved in, bringing rain and wind with it. Today's forcast high? 42 degrees. Tonight's low is forcast to be below freezing. The down side to this is that people in People's Republic of Austin don't know how to drive unless it's sunny and 80 degrees. Put something slick on the roads, and people freak out. Never fear. It's supposed to be up near 60 by this weekend. Someone with entirely too much time on their hands did a survey, asking hiring managers some of the more unusual excuses people have given for not coming in to work. Here are the top responses. TVLand, that bastion of black and white tv shows that I try to NEVER NEVER watch, has compiled a list of the top 100 TV Quotes & Catchphrases. No, I'm not going to list all 100- click on the link. Am I out of touch? I don't think so... I'm just not a fan, anymore, I guess. It's been a while since I've done a round-up. Let's see what the media thinks is important this morning. Going to church is healthy. Shamu got a little... rough... with one of his trainers. The View needs to make breathalizer tests mandatory for all guests. What's up with the stingrays in Australia? Well, that's it... I need another warm beverage. The cold front is here. No, I'm not talking about the boys and their voracious appetites. I'm talking about annoying little moths that have decided that they like living in my pantry. At first, I thought, 'a moth is a moth is a moth.' Silly me! The cedar blocks I bought and put in the pantry will just make the pantry smell good- they mean nothing at all to these nasty little monsters. My only option is going to be long, drawn out, and not cheap. We'll have to take everything out of the pantry (except the washer and dryer... those are staying put), trash all of the carbs (flour, sugar, pasta, rice, dog food), toss in a bug bomb, and scrub everything down. Then I'll have to watch out for the little buggers, just in case they leave more eggs around. So... how many of you were up bright and early this morning, credit cards and check books in hand, ready to take on the hordes of other insane shoppers trying to get that really good deal? 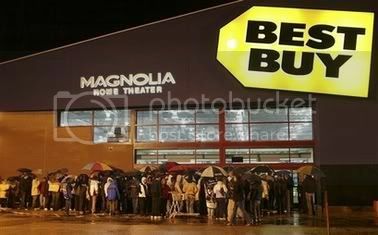 Come on... admit it... you were out there, standing in front of Best Buy, waiting for the doors to open. No, I'm not in that photo. But I took the fact that I was wide awake at 5:30am as a sign that I was to venture out into the insanity. I picked up some stocking stuffers and a gift or two... nothing major, but I did get a start on the Christmas shopping. I'm not going to forget the Reason for the Season. Believe it or not, it's really not all about turning the big box stores' accounts from red to black. That's just a perk for them. This was in the book See, I Told You So by Rush Limbaugh, and he reads it routinely the day before Thanksgiving. Definitely food for thought, no? "But this was no pleasure cruise, friends. The journey to the New World was a long and arduous one. And when the Pilgrims landed in New England in November, they found, according to Bradford's detailed journal, a cold, barren, desolate wilderness," destined to become the home of the Kennedy family. "There were no friends to greet them, he wrote. There were no houses to shelter them. There were no inns where they could refresh themselves. 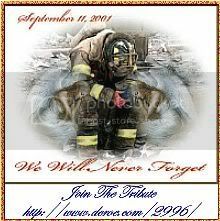 And the sacrifice they had made for freedom was just beginning. During the first winter, half the Pilgrims – including Bradford's own wife – died of either starvation, sickness or exposure. "When spring finally came, Indians taught the settlers how to plant corn, fish for cod and skin beavers for coats." Yes, it was Indians that taught the white man how to skin beasts. "Life improved for the Pilgrims, but they did not yet prosper! This is important to understand because this is where modern American history lessons often end. "Thanksgiving is actually explained in some textbooks as a holiday for which the Pilgrims gave thanks to the Indians for saving their lives, rather than as a devout expression of gratitude grounded in the tradition of both the Old and New Testaments. Here is the part [of Thanksgiving] that has been omitted: The original contract the Pilgrims had entered into with their merchant-sponsors in London called for everything they produced to go into a common store, and each member of the community was entitled to one common share. "All of the land they cleared and the houses they built belong to the community as well. They were going to distribute it equally. All of the land they cleared and the houses they built belonged to the community as well. Nobody owned anything. They just had a share in it. It was a commune, folks. It was the forerunner to the communes we saw in the '60s and '70s out in California – and it was complete with organic vegetables, by the way. Bradford, who had become the new governor of the colony, recognized that this form of collectivism was as costly and destructive to the Pilgrims as that first harsh winter, which had taken so many lives. He decided to take bold action. Bradford assigned a plot of land to each family to work and manage, thus turning loose the power of the marketplace. "That's right. Long before Karl Marx was even born, the Pilgrims had discovered and experimented with what could only be described as socialism. And what happened? It didn't work! Surprise, surprise, huh? What Bradford and his community found was that the most creative and industrious people had no incentive to work any harder than anyone else, unless they could utilize the power of personal motivation! But while most of the rest of the world has been experimenting with socialism for well over a hundred years – trying to refine it, perfect it, and re-invent it – the Pilgrims decided early on to scrap it permanently. What Bradford wrote about this social experiment should be in every schoolchild's history lesson. If it were, we might prevent much needless suffering in the future. "'The experience that we had in this common course and condition, tried sundry years...that by taking away property, and bringing community into a common wealth, would make them happy and flourishing – as if they were wiser than God,' Bradford wrote. 'For this community [so far as it was] was found to breed much confusion and discontent, and retard much employment that would have been to their benefit and comfort. For young men that were most able and fit for labor and service did repine that they should spend their time and strength to work for other men's wives and children without any recompense...that was thought injustice.' Why should you work for other people when you can't work for yourself? What's the point? "Do you hear what he was saying, ladies and gentlemen? The Pilgrims found that people could not be expected to do their best work without incentive. So what did Bradford's community try next? They unharnessed the power of good old free enterprise by invoking the undergirding capitalistic principle of private property. Every family was assigned its own plot of land to work and permitted to market its own crops and products. And what was the result? 'This had very good success,' wrote Bradford, 'for it made all hands industrious, so as much more corn was planted than otherwise would have been.' Bradford doesn't sound like much of a..." I wrote "Clintonite" then. He doesn't sound much like a liberal Democrat, "does he? Is it possible that supply-side economics could have existed before the 1980s? Yes. "Read the story of Joseph and Pharaoh in Genesis 41. Following Joseph's suggestion (Gen 41:34), Pharaoh reduced the tax on Egyptians to 20% during the 'seven years of plenty' and the 'Earth brought forth in heaps.' (Gen. 41:47) In no time, the Pilgrims found they had more food than they could eat themselves.... So they set up trading posts and exchanged goods with the Indians. The profits allowed them to pay off their debts to the merchants in London. And the success and prosperity of the Plymouth settlement attracted more Europeans and began what came to be known as the 'Great Puritan Migration.'" Now, other than on this program every year, have you heard this story before? Is this lesson being taught to your kids today -- and if it isn't, why not? Can you think of a more important lesson one could derive from the pilgrim experience? So in essence there was, thanks to the Indians, because they taught us how to skin beavers and how to plant corn when we arrived, but the real Thanksgiving was thanking the Lord for guidance and plenty -- and once they reformed their system and got rid of the communal bottle and started what was essentially free market capitalism, they produced more than they could possibly consume, and they invited the Indians to dinner, and voila, we got Thanksgiving, and that's what it was: inviting the Indians to dinner and giving thanks for all the plenty is the true story of Thanksgiving. The last two-thirds of this story simply are not told. Now, I was just talking about the plenty of this country and how I'm awed by it. You can go to places where there are famines, and we usually get the story, "Well, look it, there are deserts, well, look it, Africa, I mean there's no water and nothing but sand and so forth." It's not the answer, folks. Those people don't have a prayer because they have no incentive. They live under tyrannical dictatorships and governments. The problem with the world is not too few resources. The problem with the world is an insufficient distribution of capitalism. I found this at Dry Bones. Sounds about right, doesn't it?